This is part three of a tutorial series covering the usage of Core Data in Swift to write iOS apps with persistence. If you haven’t read part one yet, read that first. If you really want to get your feet wet, my Swift book which is now available for pre-order with early access. // Create a sort descriptor object that sorts on the "title"
First, we just need to implement the canEditRowAtIndexPath callback from the UITableViewDataSource protocol. In our case, we’ll be able to delete anything, so we can just return true all the time. But, if for example we had some entries locked, we could check the indexPath and return false instead. Now, this tells the UITableView that we can edit these rows (deleting a row is a form of editing it.) But iOS will look for one more callback, tableView:commitEditingStyle:forRowAtIndexPath. This method gets called on the UITableViewDataSource as well, and it’s called upon performing the swipe-to-delete action on iOS. Without this method implemented swipe-to-delete will simply be disabled. Next, we delete the object in Core Data using the deleteObject method on the managedObjectContext we computed earlier. Now, we can update the table view itself by calling self.fetchLog() again. We could stop here and called reloadData() on the tableview, but instead we can use the deleteRowsAtIndexPaths:withRowAnimation: method of the table view to get some free table view animations. Try running the app now, and you can swipe left on a table view row to delete it. You’ll get some free animations, and this data is updated in our Core Data object graph. Being able to delete objects is great, but we also need to be able to add items if this is going to be a real app. Let’s make an adjustment to our viewDidLoad() code. First, we create a UIButton instance, and set it’s size to be equal to 44×44 points. The position will be at an x coordinate of 0, and a y coordinate of whatever the screen height is, minus the size of the button (44 points) This puts it at the bottom of the screen. We set the title to simply “+” to indicate adding a new item, set the background color, and add a target. This function will create a UIAlertController object with a text field by using the addTextFieldWithConfigurationHandler method. I’ll probably go over this as a separate blog post at some point, but for now it’s enough to know that when the handler on the “Ok” action gets called, the textField’s text value is inside of textField.text. We can use this to take input from the user without adding too much more view work. Our method will take in the title as the only argument, and use the createInManagedObjectContext function we created earlier to add a new record with the title of title. For now, we can leave the text blank. Similar to how we did before with the deletion, we need to call fetchLog() to update our table view’s backing array, logItems. Finally, we can create our NSIndexPath for the new item, and called insertRowsAtIndexPaths to animate in the new row. Running the app you can now add and delete rows to our table, backed by Core Data. If you close the app and restart it, you may notice that the data is reset every time. This is happening because Core Data doesn’t persist automatically, you must explicitly call save for that behavior. So as a final step in this tutorial section, let’s create a save() method in our ViewController.swift file. The API is pretty simple just call save() on the managedObjectContext. Optionally you can include an NSError pointer to capture errors. The save() function returns true on success, and false on failure. If the save succeeds, your data will now persist. Let’s call our save() method after the user adds or removes an item. Running the app we now have a super nifty app where we can add or remove items from a list with neat animations! This concludes part 3 of the Core Data tutorial for now. The full source code can be found here. In the next section, we’ll set up migrations so you can make changes to the schema of your live apps. Core Data Migrations Tutorial in Swift ». As always, be sure to subscribe to my newsletter for tutorial updates and more, and take a look at my upcoming book, which is now in early access. This entry was posted in iPhone Development, Programming, Swift and tagged core data, ios, swift, tutorial by Jameson Quave. Bookmark the permalink. When i Download your code, everything works fine, but mine don’t, there is a thing to do in storyboard to allow this button? And strange enough when I watch your storyboard from my Xcode, he is completely empty (often happens to me this time, maybe a bug with Xcode) but the app works fine. It’s not a bug, there is no content in the storyboard, everything is added programmatically as shown in the tutorial. If your delete button isn’t showing then your two callback methods aren’t present. The first is the method containing “canEditRowAtIndexPath” and the second containing “commitEditingStyle”. You need to implement both of these functions as defined in the tutorial in order to see the delete button. ok, thanks for the answer. I understand for your code (the empty storyboard). For the other issue, I had actually implemented the two methods that you describe “canEditRowAtIndexPath” and “commitEditingStyle”, this is why I don’t understand this problem :/ Probably a bug from Xcode, I only see that. I ran into this same problem. However, I was adding my TableView through Interface Builder – following Jameson’s “Developing iOS 8 Apps Using Swift” tutorial, and I don’t know enough about Size Classes to know if adding the TableView through code (and setting its width to the View’s width) does the trick or not. Regardless, the simplest answer seems to be disabling Size Classes. If you go into Interface Builder, click on the ViewController in question, then make sure the File Inspector tab is open in the Utilities area. Now look under the “Interface Builder Document” section and you can toggle the “Use Size Classes” option. After doing this you should be able to resize your TableView as needed and, after re-running your app, see the Delete button on swipe. All that said, in the long run an understanding of how Size Classes and Auto Layout work is the way to go, but I’m still learning that myself. (Note: not sure if Jameson covers this in his tutorial series or book, but here is a pretty good article I found discussing this: https://www.codefellows.org/blog/size-classes-with-xcode-6-one-storyboard-for-all-sizes). Hi, i have a question [logTableView .deleteRowsAtIndexPaths([indexPath], withRowAnimation: .Automatic)] why do we need  ?? means to create an array with whatever is inside. Since the API wants “rows” and not “row”, it’s expecting between 1 and.. um.. more. So you have to say its an array of indexPaths… with just 1 record.. indexPath. In practice I would recommend saving and fetching in their own controllers, not tied to a View Controller. The View Controller should just call out to a class set up to handle this kind of stuff asyncronously. Which is the best way to escape this undesired effect? Well, I came up with a solution: I created NumberOfReruns entity in Core Data where I put a counter for reruns and now the app checks this counter before executing the array population. Not sure if it is the best way. This is a case of pre-populating data basically. In practice you would either load in a default database, or just check to see if the data is already in-place by counting records, or looking for a specific record. Your method works fine too, except that if a save fails for whatever reason, you might end up with NumberOfReruns greater than 1, but without the records actually inserted. I’m fairly new to Xcode and IOS programming but have been programming in other environments for many years. As a means of learning programming for this “new” environment I have been working on developing an app which relies heavily on locally stored, persistent data. I have gone through many blogs and tutorials and I find your treatment of the subject matter to be extremely well thought out and easy to follow. You provide insight into why things are done without overloading the novice with unnecessary detail or theory. You also don’t simply regurgitate the information from Apple resources and instead restate the pertinent points in a manner that is far less intimidating and much more easily understood. Keep up the great work! I look forward to reviewing your posts on other topics. why you initialize the buttton by coding ? It’s an arbitrary decision. I like to show both methods in my tutorials. Hopefully you understand what I want to accomplish. I’m just curious is using Core Data the best approach for an application like this or is Core Data overkill. Any insight would be super useful and appreciated. Thanks again great stuff. Core Data is probably overkill for your app, but I don’t think there’s a much simpler alternative that won’t a bunch of it’s own problems. I’d say go with Core Data. I read parts 1-3 and this was fantastic! Thanks for doing this programmatically, too! I needed to create a categories UITableView application and this was indispensable over the last few days, just got the app done. 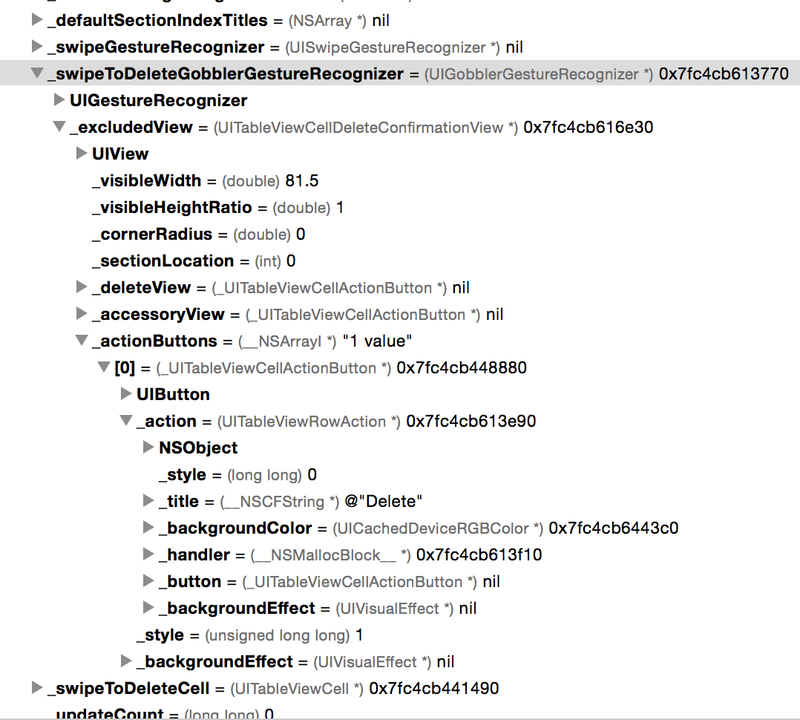 I’m trying to understand how the swipe to delete works without us needing to write any gesture recognizer code. Is there some magic under the hood that makes the editingStyle of a cell equal to Delete when you swipe to the left? This may not have answered your question, but the short answer is that Apple did a lot of the work for you already, and when you implement the protocols listed, such as UITableViewDataSource and UITableViewDelegate, what you’re really doing is intercepting some of the things that will happen by default from the iOS SDK. Got it. I used magic in the way people use the word magic to describe Rails. While you could implement it yourself most people don’t and most don’t understand what it being done for you. Apple is doing enough work here that if your target audience was experienced engineers in other languages/platforms I would suggest you add an explanation. maybe its an oversight but after creating/deleting objects from the datastore, you never call save on the managedObjectContext to commit. As a side note this tutorial could use a little more explanation. b.) deletion – why do you have to fade? best practice or just to show you could do it? c.) creating initial data. i would imagine you dont want to create data every time the application runs. a simple explanation to put in viewDidload, run app to create the data, comment out viewDidLoad, then re-run the app. thank you for sharing the knowledge. am just standing to learn IOS after doing windows for years. i have tried using CoreData to create master/detail records in past using NSManagedObject. Until i saw this i was using a viewmodel object to transfer thing in and out of my array. also the samples i have seen from so called “experts” for deleting records was to add a new record at the old index then delete the old record ( i did understand the logic as we are dealing with array; old record will be pushed down) I just question why Apple will create an API that works like that. IOS takes getting used to but am beginning to adjust and put up with some of the annoying ways that Swift compiler and API have.